I spent two weeks of February working in South Africa. I tell you this not to make you jealous although temperatures were around the 30 degree mark in glorious sunshine while those I left behind in England were forming local action committees to watch puddles. Neither am I trying to suggest some sort of superiority that I get to swan off to nice places. I am all too aware of how lucky I am and am suitably embarrassed and slightly guilty. The reason I started out by saying that I was away for February is because it meant that I missed most of the Winter Olympics. Which is sad, because Im fond of a bit of curling, and can always be relied upon for patriotic cheers when brave (yet always beautiful) British girls throw themselves down slippery chutes on high-tech tea-trays faster than anyone else. But I did catch the last couple of days of the BBCs coverage, over which I cast a critical eye. Largely because it appeared, well, a bit ramshackle. The links were done from the plaza outside the various venues, with a couple of handheld cameras. After the closing ceremony, the sainted Claire Balding was doing her wrap-up remarks, in which she made an important point about the host country trying to show a new face of Russia while still maintaining its severe anti-gay stance. But the closing shot was of a supermarket trolley loaded up with bits of equipment and a hand-written notice. This was clearly not a one-off appearance. The trolley has its own Twitter account and Facebook page. Mumsnet, of all things, has a thread on it. 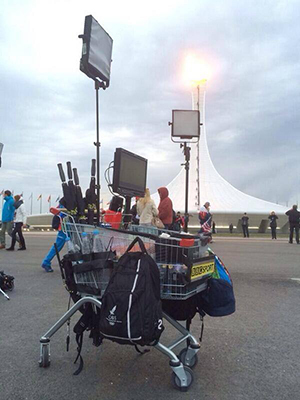 After the spectacular slickness of the London coverage, what was the wobblycam and the trolley all about? I have no idea of the true reason, but I wonder if it was a reaction to the usual boring comments in the gutter press about how many staff the BBC sends on jollies like the Olympics. There is a tabloid newspaper in the UK which is so vile that I will not name it that never misses a chance to bash the BBC. It claimed the 95 people that the BBC sent to Sochi to be a scandalously high number. Clearly they have never worked in television. That the number could be as low as it was is thanks to our ability today to send a lot of content over fast data lines. Rather than putting the people in Sochi, the BBC elected to spend the money on a lot of bandwidth. That meant that much of the work was done back in Salford and not on site. It was one of the first real, high-pressure deployments of remote production. In this case, all the event feeds were collected from the International Broadcast Centre and transferred in real time to the UK, where all the post production work on packaging stories took place. This is a revolution in the way we make television, and in many ways it is an exciting one. The result should be better programming for audiences, more engagement, and more re-use of content in companion apps and second screen services. The thinking is that you already have comprehensive post production facilities back at base, in nice comfortable centrally-heated/air-conditioned rooms with ergonomic chairs and calibrated monitors. Editors know which canteen serves the best coffee, and they know when to go there to avoid the queues. So high productivity and reduced expenses: what is not to like? Well, first of all it is no longer a special event for the crew, it is business as usual. That may be good news, or it may be that the team bonding that invariably happens when you are away from base really does add an edge. If you have worked on site on a big sports or live event, do tell us if the pressure and the difficulties spur you on. Second, maybe there is something in giving the team a jolly every now and then. Motivation and staff retention could be boosted by the prospect of a nice trip on location every now and then. I cannot imagine that too many people actually were heartbroken at not going to Sochi and its unfinished hotels. Especially given that it could be uncomfortably close to a war zone before the de-rig is finished. But I am sure that there are many people who have had the dates of this summers World Cup in their diaries for some time, and have been gently lobbying for a few weeks work in Rio. I know that I would. So on the one hand we have reduced costs and predictable performance; on the other we have staff motivation and the indefinable extra you get out of people under pressure on site. I think this is an argument that has still to run. The inescapable fact, though, is that data capacity is growing fast, and it will not be long before broadcasters will expect to take multiple feeds at uncompressed or very lightly compressed resolutions from location back to wherever they want to do the work. None of which explains the BBCs wobblycam and trolley. Really: what was that all about?